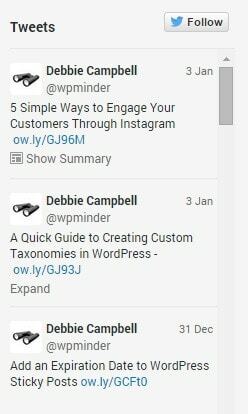 I do a lot of social media posting as the owner of WP Minder, and there’s especially a lot of Twitter activity. This weekend I decided to post my Twitter feed on wpminder.com. If you’ve done this yourself, you know what a pain it can be. You have to jump through a number of hoops including creating an application with the Twitter API (application programming interface). Your eyes may be glazing over already and I don’t blame you; it is confusing. Here’s what’s involved in creating a Twitter application – this is a great step-by-step guide, by the way, but if you can avoid doing this, why wouldn’t you? So I found a nice Twitter feed plugin that doesn’t require you to work with the Twitter API at all. It’s called Easy Twitter Feed Widget. What this plugin does is add some customization capability – colors, links, sizes – to the basic feed widget provided by Twitter, which you can get by logging into your Twitter account and going to https://twitter.com/settings/widgets/new. To use the plugin, you’ll get your Twitter widget ID from that page by creating a new widget and then copying the Widget ID from the URL – it will look something like “419173025219799552.” This is what you’ll paste in your new Easy Twitter Feed widget in WordPress. It takes about 5 minutes to get this up and running. If you’d like to display tweets on your own site or blog, give this plugin a try.